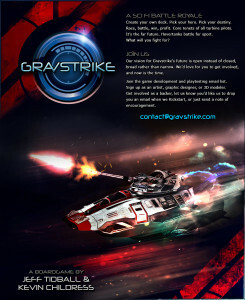 Gravstrike is now on Twitter at @GravstrikeGame. Follow us for game development news, playtesting updates, newly created art, background tidbits on the Gravstrike world, and more. Welcome to Gravstrike on the web! If you’ve been following us since the beginning, you may be acquainted with the static image — shown here — that’s been holding down gravstrike.com since roughly Gen Con 2014. Thanks to a concerted effort from all involved, including the indomitable Joey Lee of Wolf&Fox Design, we’re really happy to be publishing the new site you’re looking at now. This new look and functionality well help us make playtesting files more readily available, keep the world up-to-date with Gravstrike news, host discussions about the game and the world, and get you involved in making Gravstrike a success.